How often have one shouted at the person on the other end, because things were not done exactly as they wanted, or there was some delay in getting what they wanted? Has one ever been at the receiving end? If the person has ever worked in customer service they would have experienced the shouting and rude behavior from the customers. However, if the customer had ever worked in a customer service job, they would know, how much the rude behavior might have hurt the customer service person. This article here tries to discuss the reasons why yo should work in customer service industry. One would discover on how to work in a stressful environment. The superiors or customers both keep an eye on the customer service people and how they are going about their job. This might add up to the pressure that a customer service person goes through while doing the job. The customer service also learn to handle pressure without getting hassled. The people who have worked customer service jobs will do well even under pressure. Working in customer service is definitely no easy job. The customer service person normally meets with all kinds of customers, some very polite and soft spoken whereas many others are more often , pretty rude. Hence, they learn the knack to deal with people. Even in the face of downright rudeness from customers, the customer service people have to remain calm and soft spoken. Whatever, the response from the customer, the customer service person have to behave respectfully. One would also learn patience. 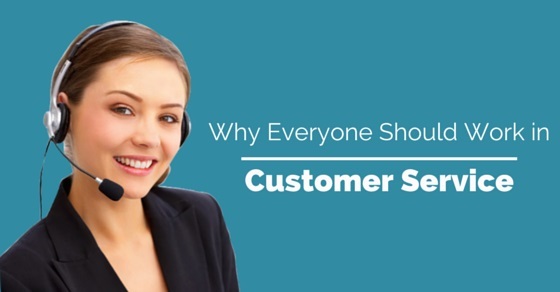 One major advantage to working in a customer service job, is that the person would also get training on how to speak to the customers, thus learning to communicate well. They would know how to communicate, according to the requirement of the customers. At times, one can communicate non verbally as well on other occasions, one would have to speak plainly. One would also learn on how to listen properly to a person. Whatever the conversation or rude behavior from the customer, more often than not, things are said in the heat of the moment. They might not have meant what they said. A customer service person would learn to take everything in stride. Do not fret if things go haywire, while on the job. One would learn how to spend more time on finding a solution rather than wasting time fretting about the damage. How often have one been frustrated or angered because the customer service person chose to not accept a coupon, which has expired validity date on it. One would also learn to not hold the customer service person responsible for the trouble they encounter. The person would also have a better knowledge and understanding of all aspects of a customer service job. When one is in a customer service job, one quite often encounters all kinds of people. Most of the people, are rude and angry, when things are not to their liking. Customers might yell at the customer service people. The customer care person, learning to handle all this will also learn to handle frustration. They will also learn patience, because if they react or appear as rude as the customer, the service person might lose the job. When one has worked in a customer service job, the person will learn to take anything that is dished out to them from the customers without losing one’s cool. The person will also learn to be tough. This is because, they know that venting out their frustration on the customer might as well cost the person their job. If the person has worked in customer service, at one point in time, the person would learn to appreciate the true value of friendship. One could go on to make a lot of friends. Since, working in customer service jobs one comes face to face with a lot of people. It is found that most of the people,who have worked in customer service job will turn out to be good listeners. It is part of their job, to respond to people as per the requirements of the customers. It becomes an intrinsic quality within the customer service person, so that they go on to listen to people while they talk. Given that, most of the people who have worked in customer service jobs are very polite and helpful, they find themselves doing favors for others. They try and make it easy for others, probably hoping that someone would help them if there was requirement for it. Many a times, a person working in a customer service have had to hear it from the customers for no reason whatsoever. However, when it was time to apologize, very rarely have a customer ever come forward to do so with the customer service personnel. At the same time, they rarely get appreciated for the job well done. Hence, they know the importance of a heartfelt sorry. Waiting to hear it often, the person who has worked in customer service would not have any inhibition to part with a heartfelt apology, if it is so required. The person who has worked in a customer service job would have to learn how to leave the ego behind. They will have to forget the pride and respond to the requirements of the customer. They may also have to learn how to take insults from the customer as well as get scoldings from the boss, for no reason whatsoever. This definitely does away with the ego of the person, who works in a customer service job. A Customer service person always tries his best to fulfill all the requirements of the customers, so as to make them fully satisfied. They also spend their time, trying to make the customers happy. It is seen that if the job, for which they called up the customer service is completed satisfactorily, the customers would be totally happy. It has been seen that most of the customer service jobs, require the person to work hard, without getting much time off. For this reason the person who has worked in the customer care before would be happy with whatever time they can get off. Working for long hours, without any time off would make a person to appreciate whatever free time they can get. It is seen that for most of the time, a customer service person is ill treated by the customers to a large extent. The customers behave rudely with the person. In such instances, If a person is treated with kindness by the customer, then one is sure to appreciate it. Since, it is a rare thing to be treated with kindness, most of the people goes on to learn the importance of kindness. Now, it has been seen that customers get angry at the customer service for quite often very simple things. At the same time, it is the duty of the customer service person to be very thorough and punctual with their job. It is also the duty of the customer service officer to try and rectify the faults made at the time. On the other hand, one should also realize that the customer care people are also human beings and they might make mistakes or could be they are not even guilty of it. If a person hopes that people would treat them better and with respect, he should also make an attempt to try and be polite to others. One has no right to demand and expect for respect, when one does not give it. For this reason, it would be best if a person can choose to be polite and treat the customer care personnel or other person with kindness. One can also try to behave more humanely with the customer care people.